Like most states, Maryland’s economy suffered greatly during the last recession and like most states, it has rebounded to some degree. But many residents still struggle financially and need help covering the basics like food, rent, utilities, and healthcare costs. The Maryland United Way published a report that highlights the hardworking Marylanders who find it difficult to make ends meet. These people (and perhaps you fall into this category) are known as ALICE (Asset Limited, Income Constrained, Employed). The main point is that these individuals have jobs—and often hold more than one—but still live paycheck to paycheck. All it would take is one unplanned for event like an illness or rent hike to upset their delicate financial equilibrium and create a budgetary crisis. According to the report, an astounding 36 percent of Maryland households live in or fall below the ALICE threshold. If you use credit cards to make up the shortfall between your income and living expenses each month, you may also be dealing with mounting credit card debt too. That can be a worrying situation, but help is available. Charities like the United Way of Maryland can help families get onto more stable ground financially and debt-resolution companies in the area can help you deal with your debt. If you’re ready to start tackling your debt, there are a variety of paths that can lead you to financial freedom. The simplicity of a debt consolidation loan makes it an appealing solution for a great many consumers—you get a loan and pay off your outstanding debt with it. Of course, you haven’t made the debt disappear, you still have to pay it. But the loan will have better terms and a lower interest rate, which should make it more affordable and fit your budget better. This tactic may seem like the obvious one given that you’re keen to reduce your debt and the related stress. But first consider the pros and cons of a debt consolidation loan. Maryland residents can call Freedom Debt Relief at 800-910-0065 for a free debt evaluation to find the right solution for them. You’ll need good credit, a good or at least fair credit score, and a debt-to-income (DTI) ratio of 50 percent or less. If you have a good or excellent credit score, you should qualify for the lowest interest rate. The terms include the amount you’ll borrow, the interest rate, and the length of time you’ll have to pay the loan back. Debt consolidation loans typically last from two to five years. You’ll need to substantiate your income with paystubs and show proof of your identity with a driver’s license or passport. The lender will then pull your credit report, creating a hard inquiry. A hard inquiry will cause your credit score to dip temporarily, but when you begin paying off your credit cards with the loan, your score should start to improve again. In contrast to the hard-working Marylanders who fall under the ALICE acronym, it appears that Maryland households are also some of the wealthiest in the country with a median household income of $72,483. In fact, Maryland placed first in the nation with the most millionaires per capita in 2013. This is hard to grasp given that low-wage jobs dominate the state economy, with most paying between $10 and $15 per hour. Regardless of where you fall on the earning spectrum, if you’ve managed to amass a fair bit of debt, you’re not the only one. People all over Maryland struggle with debt. The good news is that it is possible to turn your financial situation around. 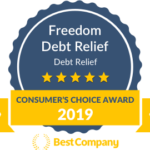 The ancient proverb states, “A journey of a thousand miles begins with a single step.” Take your first step toward financial freedom today by seeing how Freedom Debt Relief can help you. Call 800-910-0065 now for a free debt consultation.